Cassie Lewis is a young Australian poet currently living on the west coast of the USA. 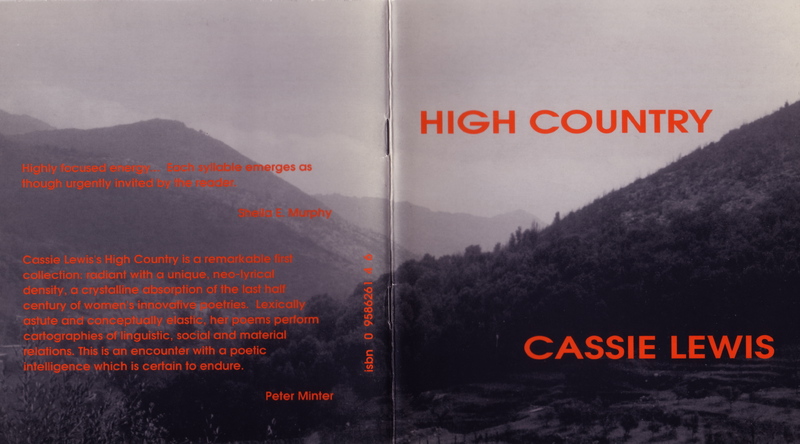 Her new collection, High Country, follows a pamphlet of ten poems Song for the Quartet (SOUP Publications, Melbourne 1997) and was published a little earlier last year than Potes & Poets’ Winter District – a booklet that combines work from both chapbooks together with some new material. 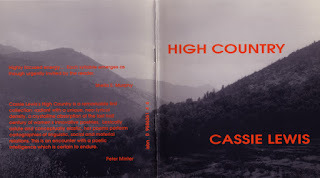 High Country is a distinctive looking book, with a black & white cover photo of wooded hills and vales subtly brushed by misty chiaroscuro – the background to a dramatic sheer orange typeface for the title and blurb. Its pocket-size format enhances the attractive, yet simple design. This lake, a toy for wilderness, a call to other duties. What would hope do to me if I couldn’t stare it out ? Hear it moving like washing foam, like drunken vowels. Past the verandah, fresh snow grazing on astonished winter flowers. And how days are unbroken…. With its palm trees, was more alive than I was. you set up an echo as you shout my name. on the famous corner. Hummingbirds; stars. I never saw how two hemispheres breathe differently. Are hamlets of equal worth, is globalisation a mirage ? cures that make us stronger, champions of all we crave. Almost ten years ago, as a teenager, Cassie Lewis responded to a handwritten note posted in the window of an inner-city Melbourne bookshop offering poetry lessons at an hourly rate from ‘John Forbes, Australian Poet’. John directed Cassie towards poets like Frank O’Hara, Ted Berrigan and David Shapiro among others. Cassie credits Shapiro’s poem 'For the Princess Hello' with having symbolically propelled her to first publication. John Forbes commented to Cassie that poetry should ‘look out, not in’ – that by looking out you discover what’s in you. This suggests a view that poetry is linked continually to a state of consciousness or that the act of making poems involves a kind of extension of consciousness. This confident first collection, High Country, reflects and tests that suggestion faithfully.